You can convert the coordinate system of raw data in the Voxler worksheet. Click File | Open, select the data file you have and click Open. 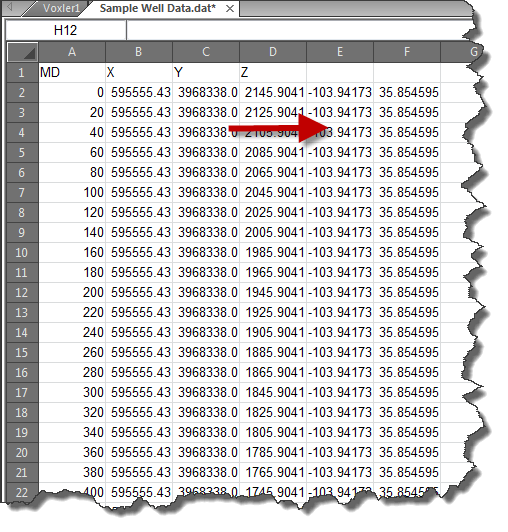 After the data file opens in the Voxler worksheet, click Data | New Projected Coordinates. In the New Projected Coordinates dialog, assign the appropriate X and Y columns under Source Columns (these are your current X and Y columns). Click the (...) button to the right of Source Coordinate System. In the Assign Coordinate System dialog, select the current coordinate system for the data. For example, to select UTM, you could navigate to Projected Systems | UTM | North America and select North America NAD27 UTM zone 04N. Click OK. The selected coordinate system is entered as the Source Coordinate System. Designate the X and Y columns under Target Columns. This is where you want the re-projected data (ie. latitude and longitude) to be entered. By default, the first two empty data columns are entered. Click the (...) button to the right of Target Coordinate System to enter the target coordinate system. For example, let's say we want to convert the UTM to latitude and longitude. In the Assign Coordinate System dialog, expand the Predefined | Geographic (lat/lon) category. Under this category many different datums are listed. You can choose which datum you want your lat/long coordinates to use. Most simple lat/long coordinates use World Geodetic System 1984 (WGS84) as the datum. Click OK. This coordinate system is entered as the Target Coordinate System. Click OK and the coordinates in the designated source columns are converted and entered into the designated target columns. Click the File | Save or File | Save As commands to save the data. The original UTM X and Y data in columns B and C are converted to longitude and latitude data in Columns E and F.